I probably could have made this a few rows longer, and I sort of wish I had. It’s a little close-fitting. I guess this is its own pattern! The goal was something that sort of perches on the back of the head that my bangs can peek out of. And the color of the puffin is very similar to the color of the ImagiKnit I made into a Honey Cowl, so I wanted something that went along. The total length before starting decreases is about 6”. Decreases in the knit rows, first decrease was k2, k2tog, all following decrease rows were k1, k2tog. Slip/purl rows as close to keeping in pattern as possible. Ended at I think 8 stitches on a decrease row. 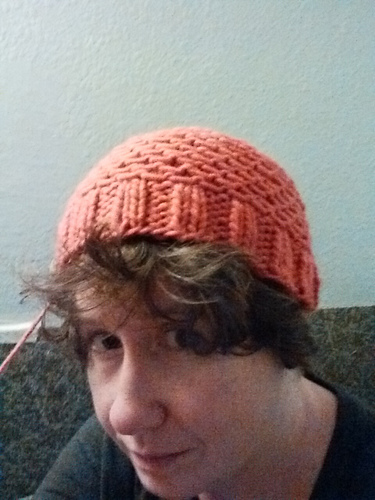 This was easy, pleasurable to knit, and really fast.